A picture of the primary mirror for the WFIRST mission. The mirror was previously part of a space telescope that was cancelled before it went to space.. 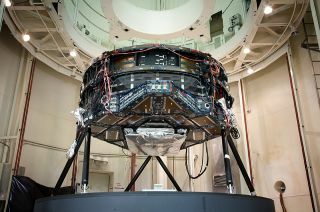 Leaders of the American Astronomical Society released a statement today (Feb. 15) denouncing the proposed cancellation of NASA's Wide Field Infrared Survey Telescope (WFIRST) in the White House budget proposal that was released this week. The AAS leadership also expressed its intention to rally support for the mission in Congress, where the final fiscal year 2019 budget will have to be approved. "We cannot accept termination of WFIRST, which was the highest-priority space-astronomy mission in the most recent decadal survey," AAS President-elect Megan Donahue said in a statement from the society. "And the proposed 10% reduction in NASA's astrophysics budget, amounting to nearly $1 billion over the next five years, will cripple US astronomy." WFIRST would be NASA's next "flagship" mission, which refers to large missions with a wide range of science capabilities. It would follow missions like the Hubble Space Telescope, the Chandra X-ray Observatory and the James Webb Space Telescope, set to launch in 2019. Its primary science objectives would be in the areas of cosmology, star and planet formation, and studies of planets around other stars. A significant portion of time would also be reserved for scientists to use the observatory for studies outside those topics. WFIRST received top ranking in the 2010 decadal survey, titled "New Worlds, New Horizons in Astronomy and Astrophysics." The decadal survey is a community-led report organized by the National Academies every 10 years that provides a roadmap for which missions or mission topics should be pursued by the community and supported by funding agencies. Compiling the report is a multiyear process that captures input from astronomers in various subfields as well as from funding agencies such as NASA and the National Science Foundation. "These efforts to achieve community consensus on research priorities are vital to ensuring the maximum return on public and private investments in the astronomical sciences," AAS Executive Officer Kevin B. Marvel said in the statement. "The cancellation of WFIRST would set a dangerous precedent and severely weaken a decadal-survey process that has established collective scientific priorities for a world-leading program for a half century. Such a move would also sacrifice US leadership in space-based dark energy, exoplanet, and survey astrophysics. We cannot allow such drastic damage to the field of astronomy, the impacts of which would be felt for more than a generation." The call to cancel WFIRST could be interpreted as a warning to the mission managers to keep the cost of the program on track, according to Marcia Rieke, an astronomy professor at the University of Arizona and the Seward Observatory, who spoke with Space.com for this article about what the WFIRST cancellation could mean for U.S. astrophysics. Rieke is co-chair of the National Academies' Committee on Astronomy and Astrophysics, which monitors how the decadal survey's priorities are being implement by funding agencies. Jon Morse, former director of NASA's astrophysics division, told Space.com that the NASA science mission directorate (SMD) "would not have given programmatic direction to the WFIRST project last fall if SMD were planning to cancel the mission; this appears to have been dictated from outside the agency." Morse, now CEO of the BoldlyGo Institute, headed NASA's astrophysics division from 2007 to 2011, during the development of the WFIRST mission concept. He also served as a senior policy analyst in the White House Office of Science and Technology Policy from 2006 to 2007. The White House budget provides a $400 million overall increase in NASA's budget, but a $165 million cut for astrophysics. Planning numbers for WFIRST requested $302 million for the 2019 fiscal year, and upward of $400 million each year through 2022. If WFIRST is canceled, it will absorb the overall cut to astrophysics and leave about $137 million for other astrophysics research. But Morse told Space.com the proposed use of WFIRST funds to absorb the overall cut to astrophysics, "steals the JWST budget wedge from Astrophysics for 'other agency priorities'; an outrageous proposal that kills the top priority in the astrophysics decadal survey and undermines future U.S. leadership in space astrophysics." Since 2008, NASA's astrophysics division's budget has been consistently below what it was in 2008, with the steepest reduction occurring in 2010. Meanwhile, every other science division (such as heliophysics and planetary science) has seen an overall rise in budgets, compared with 2008 levels. In the last three years, the astrophysics division has almost returned to 2008 levels, but the proposed FY19 budget would be a 15 percent reduction, compared with 2008 (and about a 10 percent reduction from FY18). "The community should make clear that WFIRST is crucial to future space astrophysics research and is entirely affordable if Astrophysics were provided the same kind of budgetary resources that other disciplines are receiving," Morse said. "The Astrophysics budget should be $1.6 [billion] per year, not going backwards!" It appears the AAS leadership is preparing to fight to save the mission. "We look forward to working with Congress to restore funding for WFIRST and for NASA astrophysics overall," Donahue said.